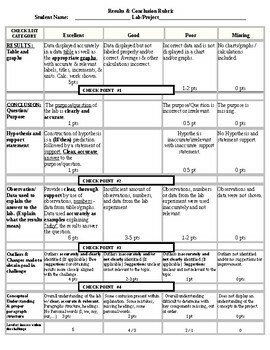 This is a general lab report writing rubric which includes expectations for beginner 9th grade lab report writing, focusing efforts on data tables/graphs and a one paragraph conclusion. This is meant to be used in cooperation with other subjects to scaffold the lab report writing process as students move through grade levels. Students use the rubric with the writing prompts to facilitate feedback from the instructor at the time of writing to develop a conclusion about the data obtained from the lab/project in one paragraph. The rubric will be used to give feedback and ultimately grade the lab report conclusion as a formative assessment. I've used this rubric after the scientific process for the lab/project has been documented in a lab notebook, the experimentation step is complete, and the data has been documented in a data table and graph(s). Instructions for how to best work through lab report writing as a process can be found here by searching, "Introducing Lab Report Writing as a Process." Also, be sure to download the accompanying writing guide for the best results. There will also be writing guides and rubrics posted for specific Physical Science engineering projects that will work under the principle of lab reports as a process rather than a product.